Many horse industry relationships are actually equine partnerships, whether the parties realize it or not. In the 49 states that have adopted the Uniform Partnership Act (“UPA”), two or more parties’ intention to carry on a business together for profit is sufficient to create a “partnership.” Note that this is true regardless of whether the business actually makes a profit, and regardless of whether the parties have anything in writing memorializing their arrangement. In the absence of a more formal structure, such as a corporation, limited liability company or limited partnership, the following situations would likely be deemed a partnership. A client and trainer agree to purchase a horse for resale, with the client paying for the horse and all out-of-pocket expenses and the trainer providing training. A stallion owner decides to “syndicate” the stallion and sells “shares” to several other people that entitle them to share in the expenses and profits. Two breeders decide to share a broodmare, with each breeder having a foal from the mare every other year. Two busy career people decide to buy a horse together so that they can share in the care, responsibilities and fun of horse ownership. Two friends decide to go into the boarding business together. One friend buys the boarding facility and the other friend runs it, with the understanding that they will split the profits. Many horse people do not realize that they are part of an equine partnership until their relationship starts to deteriorate. They are often surprised to hear that they cannot simply walk away from the horse partnership with the assets (which are, in many cases, horses), even if they originally purchased them. Even more frustrating for the party who has contributed most of the assets to the equine partnership is the fact that the other partners may share equally in the profits. Perhaps the most important consequence of forming a horse partnership is liability. A partnership is an entity separate and apart from its partners. However, any one partner can take an action on behalf of the equine partnership and bind the entire partnership. So, for example, a partner could purchase a truck in the horse partnership’s name and the partnership would be bound to honor the purchase agreement (unless the truck dealer was aware that the partner didn’t have authority to purchase the truck for the partnership). As a partner, you are jointly and severally liable for the obligations of the partnership. So, if the partnership can’t pay for the truck, you may have to pay out of your own pocket. Note that this is true even if the other partners didn’t express authorize a partner to take an action or incur a debt. When an equine partnership is formed, the partners automatically owe each other fiduciary duties. They must put the interests of the partnership first and their own interests second. The “partnership first” concept includes business opportunities. For example, if a stallion partnership is actively seeking broodmares of a certain type and a partner runs across a mare for sale of that type, the partner cannot buy the mare for herself without first offering it to the stallion partnership. She also cannot purchase the mare and then resell it to the stallion partnership at a profit. When dealing with equine partnership property, the partners must be respectful of the fact that the property belongs to the partnership and they cannot use it for their own purposes. For example, in a boarding stable partnership, if the stable keeps bagged shavings on hand for boarders, a partner cannot simply take a few bags with them to a show for their personal use without compensating the partnership for the shavings. Likewise, unless otherwise agreed by the partnership, a partner in a stallion syndicate cannot breed the stallion to his or her own mares without compensating the partnership. A partner also has a duty to the partnership to care for the partnership assets in his or her possession. So, for example, if you have custody of a partnership show horse, you cannot stop taking care of the horse just because you have a disagreement with your partners. This duty rises above just feeding and watering the horse – you have a duty to maintain that horse in the condition that it was previously in (or better), which includes exercise, grooming, training and veterinary care. The show horse partnership, however, is obligated to pay for the cost of that care. As a partner, you cannot profit individually from the equine partnership (other than your share of the partnership profits), unless the other partners consent. For example, if you are a partner in a stallion, and you also happen to run a boarding stable, you cannot personally profit by boarding the stallion unless the other partners agree and are aware that you are making a profit. Finally, you cannot have personal interests that conflict with those of the horse partnership. For example, if you are a trainer who is a partner in a resale horse, you cannot allow a personal interest in continuing to compete with the horse to affect your advice to the partnership on the timing of the horse’s sale. So You Have a Partnership – What Now? If you have read this article and determined that you have an equine partnership, you may wish to convert the partnership to a more formalized entity, such as a corporation or LLC, to limit your personal liability. If you choose to proceed as an equine partnership, the most important thing you can do to protect your interests is to create a written equine partnership agreement and have each of the partners sign it. The equine partnership agreement, among other details, should specify the percentage of the partnership that each partner owns, and the procedure that must be followed if one partner wants to exit the partnership (or the remaining partners want to oust a partner from the partnership). 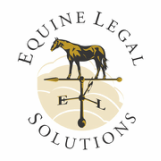 Equine Legal Solutions offers a ready-to-use Equine Co-Ownership Agreement form.